tobaccoasia 25 Mongol Tobacco's current brand offerings tribute cigarettes and other tobacco products, Mongol Tobacco appears to be the only viable one. Since 2011, the company has held a very stable (and comfortable) share of 40% in the domes- tic market, consistently selling around 300,000 master cases of its various brands per annum. This easily outstrips each one of the five international tobacco companies that in the meantime have also become active in Mongolia, distributing their products through local partners (see table 1). Plenty of unused capacity Currently employing 150 Mongolian workers and 20 Chinese staff at its plant on the outskirts of Ulaanbaatar, Mongol To- bacco currently has an annual production capacity of 2.5 billion sticks. "But we actually only utilize 50% of that," said Tsogt- saikhan Otgontsetseg, the company's r&d manager, adding that this figure includes an undisclosed amount of exports to coun- tries like Angola, Vietnam, and – lo and behold – North Ko- rea. She was quick to point out that Mongol Tobacco is actively scouting for overseas clients in order to put that idle capacity to good use. "We can easily manufacture any desired quantity to other companies` exact product specifications. Besides, Mon- golia is a very good place for tobacco manufacturing due to its favorable legal and tax framework." Furthermore, Mongol Tobacco would be very keen to enter into manufacturing agreements with any of the big multination- als, all of whom currently have to import their merchandise into the country. "We also would like to produce [the] international brands of multinational companies in our factory for their [lo- cal] distribution partners," Otgontsetseg said. Such a potential manufacturing agreement could of course help save the respec- tive companies considerable costs for logistics and import taxes. 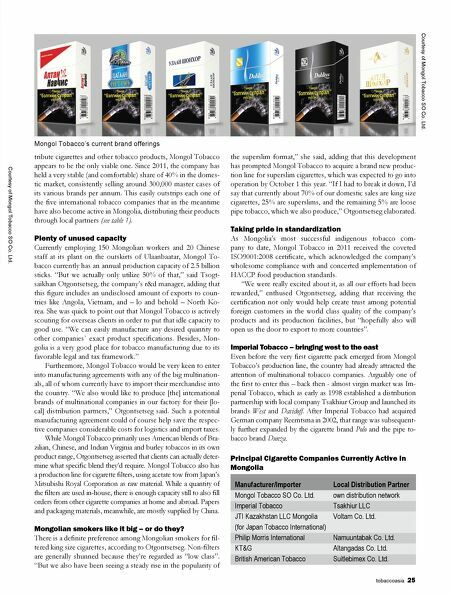 While Mongol Tobacco primarily uses American blends of Bra- zilian, Chinese, and Indian Virginia and burley tobaccos in its own product range, Otgontsetseg asserted that clients can actually deter- mine what specific blend they'd require. Mongol Tobacco also has a production line for cigarette filters, using acetate tow from Japan's Mitsubishi Royal Corporation as raw material. While a quantity of the filters are used in-house, there is enough capacity still to also fill orders from other cigarette companies at home and abroad. Papers and packaging materials, meanwhile, are mostly supplied by China. Mongolian smokers like it big – or do they? 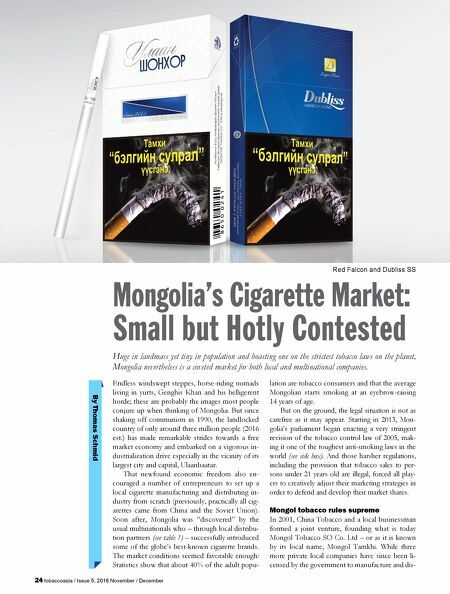 There is a definite preference among Mongolian smokers for fil- tered king size cigarettes, according to Otgontsetseg. Non-filters are generally shunned because they're regarded as "low class". "But we also have been seeing a steady rise in the popularity of the superslim format," she said, adding that this development has prompted Mongol Tobacco to acquire a brand new produc- tion line for superslim cigarettes, which was expected to go into operation by October 1 this year. "If I had to break it down, I'd say that currently about 70% of our domestic sales are king size cigarettes, 25% are superslims, and the remaining 5% are loose pipe tobacco, which we also produce," Otgontsetseg elaborated. Taking pride in standardization As Mongolia's most successful indigenous tobacco com- pany to date, Mongol Tobacco in 2011 received the coveted ISO9001:2008 certificate, which acknowledged the company's wholesome compliance with and concerted implementation of HACCP food production standards. "We were really excited about it, as all our efforts had been rewarded," enthused Otgontsetseg, adding that receiving the certification not only would help create trust among potential foreign customers in the world class quality of the company's products and its production facilities, but "hopefully also will open us the door to export to more countries". Imperial Tobacco – bringing west to the east Even before the very first cigarette pack emerged from Mongol Tobacco's production line, the country had already attracted the attention of multinational tobacco companies. Arguably one of the first to enter this – back then - almost virgin market was Im- perial Tobacco, which as early as 1998 established a distribution partnership with local company Tsakhiur Group and launched its brands West and Davidoff. After Imperial Tobacco had acquired German company Reemtsma in 2002, that range was subsequent- ly further expanded by the cigarette brand Polo and the pipe to- bacco brand Dunza. Manufacturer/Importer Local Distribution Partner Mongol Tobacco SO Co. Ltd. own distribution network Imperial Tobacco Tsakhiur LLC JTI Kazakhstan LLC Mongolia Voltam Co. Ltd. (for Japan Tobacco International) Philip Morris International Namuuntabak Co. Ltd. KT&G Altangadas Co. Ltd. British American Tobacco Suitlebimex Co. Ltd. Principal Cigarette Companies Currently Active in Mongolia Courtesy of Mongol Tobacco SO Co. Ltd. Courtesy of Mongol Tobacco SO Co. Ltd.